In this era of glossy cookbooks full of mouth-watering images and detailed photographs of each recipe step, Joy of Cooking may seem a bit old fashioned and out of date. Between its covers are recipes. Just recipes. Well, and some cooking tips, too. No glossy images and only a few basic illustrations. However, I bet you have a copy in your kitchen cookbook collection. And so did your mother, grandmother, and great-grandmother. A native of St. Louis, Rombauer financed that first 1931 edition with the insurance settlement she received after her husband committed suicide. (Talk about making lemonade out of lemons!) Publisher Bobbs-Merrill picked up the book in 1936 and it has been around ever since. 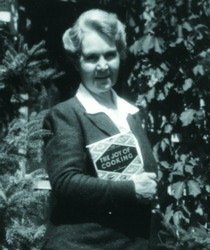 Rombauer’s daughter, Marion Rombauer Becker, took over and did the revisions of each edition until 1975. Grandson Ethan Becker oversaw the publication of the current edition, which celebrated the book’s 75th anniversary in 2006. I remember using my mother’s copy many times growing up. I also have memories of Mamaw using her copy from time to time. Mine is the latest edition, often my go-to book when I start to develop a new recipe. If you are looking for a recipe, it is probably in Joy of Cooking. Preheat oven to 350 degrees F. Line 2 cookie sheets with parchment paper or spay with non-stick cooking spray. Set aside. In a medium bowl, sift together the flour, cream of tartar, baking soda and salt. Set aside. In the bowl of a mixer, blend together the butter and sugar. Add the eggs and beat until combined. Add the flour mixture and mix until just combined. Mix together the sugar and cinnamon for the coating. Shape spoonfuls of the dough into 1-inch balls and roll in the coating mixture. Place the balls on the baking sheet 2 3/4 inches apart. Bake one sheet at a time for 10 to 12 minutes, or until the edges are lightly browned. Place the cookies on a rack to cool. These look scrumptious and have caused me to have a snack attack :-). You're so right...this IS in my kitchen and almost every kitchen I've seen. And I absolutely love snickerdoodles...one of my faves! Hi Linda! I adore snickerdoodles! They are such a beautiful yet simple cookie ... a true classic!